May I take a moment and comment on what I think to be the perfect balance?...it's you. You are already doing it. What do I know - but I love the paragraph about housekeeping - it says it all. Messes are the sign of creativity and I like that you have a kagillion hobbies and hundreds of ideas every day. I really admire that. Anyway, I know what you mean about balancing "your stuff" and making time for your peeps. Sometimes I get really focused on doing something and people (baby, husby) just "get in the way". And then other days I play with Luke all day and get nothing else done and feel a little lazy and like I became completely unorganized in one day. So, there is just that in between somewhere - shorten your to-do list but still have one I guess?? Good luck! "A clean house is a sign of a wasted life." it's definitely a huge challenge. when i first started etsy i found myself constantly telling my kids "just a minute, just a minute!" and staying up late alone working on stuff instead of hanging out with caleb etc. i really had to finally decide daytime is family time and it has to be the most important thing to me at this point in my life. with a catch: if i give them my full attention all the rest of the day, i expect them to give me naptime/quiet time just for me and i don't allow non-emergency interruptions. then i get out my list of things i want to get done and prioritize. some days it's housework, many days it's a project. the kids are happier and i feel better about myself. some days the kids are in the mood to help with housework, so we can have fun together cleaning and organizing. most days the house is just messy, but we're happy. i haven't figured out how to fit in the fitness part yet, but for me it's easiest as a family affair, like a bike ride together (we left an old beatup bike buggy in our barn if you want it! it would be great for toting issac and isabelle.) or a workout movie with all of us (even if jane is sitting on my tummy or face as i try to do a crunch.) i also seem to do a little better when i write down what i want to get done that day. we're all struggling to find that balance, but i think you're doing a wonderful job! your kids are happy and talented, you create the most lovely things, and it's easy to see your spirits are shining brightly. i feel so lucky to know such a talented and lovely person as you! Star, I feel like I could have written the same post. I also have a kagillion hobbies and one day the thought came to me, "your kids are your hobbie." It reminded me that I need to make time for the kids. It seems like on the days I have the most ideas, I have the least time. Then I start to wonder what it would be like if I didn't have kids. I could do so much! Then I remind myself my kids are the inspiration for a lot of my projects. Also, if I didn't have kids I'd be working and I wouldn't have time to do anything anyway. So...I have the same problem- always trying to balance my life. I guess we'll just keep trying, eh? Ooh, I really like the quote about a clean house means a wasted life. Hah! I look at you and Kate and wish I were being more creative. My life is out of balance on the reading side. It's all I have the energy to do after all my nights of interrupted sleep. Maybe if my fitness side were existent. . .
On a completely separate topic, have you thought of having a show in the library gallery? I asked them how they get artists and they said, "Give us your phone number and we'll put you on a list. It usually takes a couple of months." I had to disabuse them of the assumption that I have an artistic bone in my body and told them that I was asking for a super talented friend of mine. I'd be happy to let them display your lovely Lucy art, just to make them wish they'd gotten there before me. I'd love to help you gather frames and mats and shadow boxes (for cards and dolls) etc. I think I have several lying around in boxes already. Whatdya think? Thank you for your promotion efforts, I think that would be fun! Do you really think they would display my creations? I'm picturing it all now, everyone might confuse my show with a display from the Jr. High. Tee Hee! Thanks for stopping by and entering my little contest. I like the honesty in this post--I hope that you find all the time that you need and don't get wishing this beautiful season of your life away or anything like that--try to celebrate each day and know that different seasons will bring more time and more growth for certain things to resolve and mature themselves. I was just having this conversation! You are definitely NOT alone in this. As soon as you figure out the trick...let the rest of us know!! There do seem to be those few people that can keep it all together--kids perfectly clean and dressed cute with hair done, they work out everyday, house is always perfectly clean no matter what closet you look in, PTA president...that's not reality! I have learned that a lot of times it comes at a huge price--they seem to have it all together & they are crumbling on the inside! If I tackle one thing each day that is driving me nuts like laundry, or paying bills, or toiets I feel a sense of accomplishment instead of looking at all of the things that I didn't do in the day---it'll all still be there tomorrow! You have happy, smart, well-adjusted childen. And a husband that grew up in a less-than-perfectly clean home that fell in love with YOU--a creative, fun-loving girl!!! We love you, Star! Don't be hard on yourself..."try a little harder to be a little better" that saying helps me out a lot. He says a little not a lot!!! 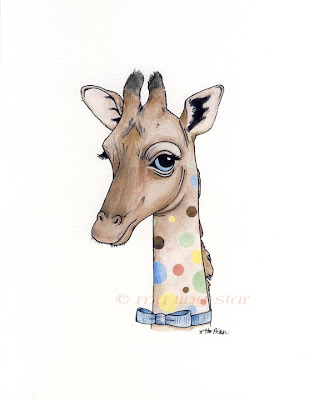 ps-LOVE the giraffe and his colors!! Did you see my post with Shea's hula hoop painting in it?? I found the perfect matte and frame...we LOVE it...thank you!!! Star you are awesome! Don't change a thing about your cute self and I still think you look like a J.Crew model! I bought you some fabric today and I'm dying to get up to your house and show it to you and hopefully see what kinds of creations you might be able to make of it.